Posted by Mary W. Matthews in Popular Culture. 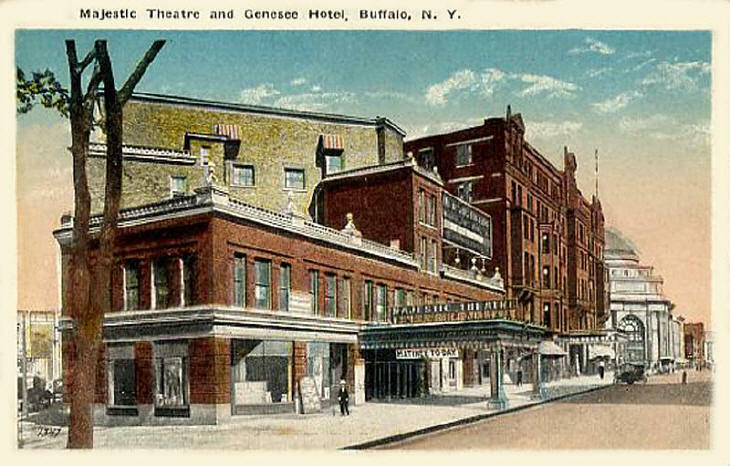 The May 8, 1942 edition of the New York Times reported that 35-year-old Mary Miller had checked into the Genesee as “M. 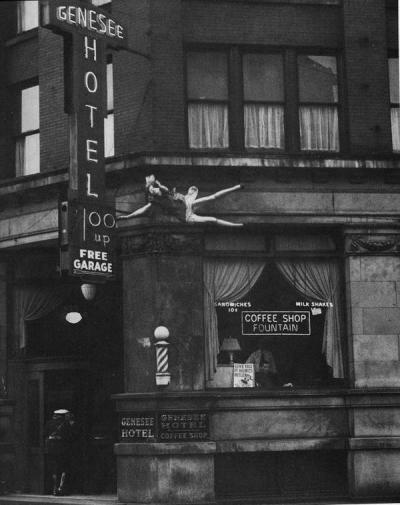 Miller, Chicago.” She “entered a women’s restroom, locked the door from the inside, and crept out onto the ledge.” (Leading us to the inference that in May 1942, hotel rooms at the Genesee did not have individual bathrooms, as we take for granted today.) Two days later, the Times confirmed that the suicide was indeed Mary Miller, who lived with her sister in Buffalo, but had told her sister that she was going to Indiana to visit relatives. The sister had no idea why Mary Miller would want to commit suicide, but this has not stopped history from referring to this dramatic photo as “the Despondent Divorcée.” My own fantasy — let me stress that I have been able to discover no facts — is that Mary Miller was in love with someone who had just been killed in World War II. The Germans had begun bombing cathedral cities in England in late April, and the Bataan Death March had just taken place, in which the Japanese killed between 6,000 and 18,000 American and Phillippine POWs with appalling savagery. (The Japanese government formally apologized for the massacre on May 30, 2009.) The legendary Battle of the Coral Sea, in which the U.S. Navy defeated the Japanese after days of bloody fighting, began on May 4, 1942 — days before Miller’s suicide. Perhaps Mary Miller was so deeply in love with a sailor killed in that battle that she could not imagine life continuing without him; perhaps she had just learned she was pregnant. Divorce was deeply shameful in 1942, particularly for women. An out-of-wedlock pregnancy could look like an unthinkable disaster for which death was the only reasonable answer. Although I’m sure it all happened in less than five minutes, I’m a little sorry that Sorgi’s first instinct was to photograph the imminent suicide rather than try to stop it. But I wasn’t there; I can’t know what was in his mind, or her demeanor. Sorgi might have seen his role as chronicling the efforts of the police to stop the suicide and his own potential involvement as impeding them. The man sitting in the window of the coffee shop, apparently unaware what was going on, or the shirt-sleeved man standing behind him (maître d’? ), who may have been wondering what the screaming was all about. The apparent calm of the woman, who looks almost as if she’s turning her fall into a dive. Her long blonde hair, which at first I thought was one of those silly hats so popular at the time. Did she feel embarrassed knowing that her skirt had flown up and the crowd she had been waving to could see her underwear? Where was the crowd whose “screams and shouts” Sorgi remembered? The sidewalk looks empty. W.H. 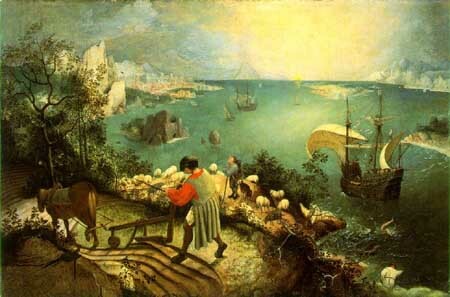 Auden had just published his poem “Musée des Beaux Arts” in 1940, a poem about a 16th-century Old Master painting depicting the fall of Icarus from the sky. In his poem, Auden talks about the painting’s everyday setting and the obliviousness of passers-by to the oil’s central drama. Auden takes note of how humans suffer while all around them life continues its humdrum way, oblivious. [while life] sailed calmly on. According to one of the links I followed, a psychologist did an experiment involving this photograph, and only 4 percent of the students noticed Mary Miller! 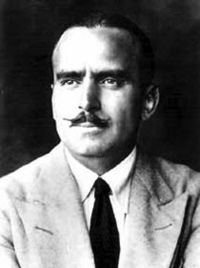 Action hero Douglas Fairbanks Sr. Unrelated cool trivia: Wondering whether Mary Miller knew about Superman (she looks almost as though she were trying for a “Superman in flight” pose), I checked Wikipedia and discovered that yes, Superman was introduced as a villain in 1932 and morphed into a superhero in 1933. 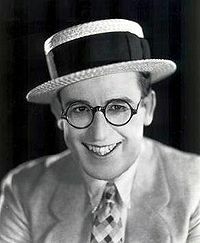 Superman was based on Douglas Fairbanks, Sr., while Clark Kent was based on Harold Lloyd! It is not a female cop and I am not a sexist. It is a male motorcycle officer who wore long boots as was the standard issue uniform. The hair…I have no idea what you are seeing in terms of hair as it is obscured by a hat. Yeah, large numbers of men were off fighting, but many older cops stayed behind at the request of local and federal governments. There is no record of a mass exodous of male cops to fight in the Big Two to be replaced by female officers. If so, the path for female to become officers would have been much easier than it has for them. Please do not rewrite history. Either way its a great in depth post! “Either way”? Dismissive. Typical. Rewrite history and then get called on it and some person then says “Either way, it is a great in depth post!”. No, it is not. It is rewriting history with some twist. People would not find out for weeks or months that their loved ones died. Usually their first indication would be that letters would stop coming. So, saying it happened right after a huge battle might mean she found out someone died in said battle is highly unlikely. Wow this is awesome! ! Great post! Where is the crowd? Obviously, off camera! The police wouldn’t let them just stand around under the victim. I have zoomed in on this picture and those are stockinged legs I see on the police officer, not boots. Her hair looks like it’s in a bun under her hat. my great grandfather was Buffalo medical examiner, Rocco N. DeDominicis. I have An original of this hanging on my wall. The police officer is a man. People tend to romanticize.suicide, which drives me nuts.. Depression or other forms of mental illness are usually the cause. I notice the barber pole and wonder if the man in the window is going to get a haircut and shave. the tucked in napkin would be explained, as well as the man in the white behind the seated man, who seems rather high up to be sitting in a normal dining chair, when compared to the height of the man in white. As to your question about where the crowd is, I would assume the police cleared the sidewalk below the jumper to protect passers by, and are watching from the same vantage point as the photog. I hope you discover more information about this photo. It reminds of that jumper photo of the woman from, maybe the 1930’s, who lands on a car in an almost sleep like position, still clutching her necklace. Great post. The author of this article errored in telling us that the police officer is a female. I have enlarged and examined the photo. It is a male officer. The date in the photo 1942 should also tell you something about gender discrimination in American History. Women were not police officers in inner cities at that time. In other photos from that day you would see the police and onlookers who were watching. He couldn’t stop her as others had tried. Btw, the photographer is my grandfather and we have all the other photos after. The poem that follows was inspired some years ago when, quite by chance, I came across the Genesee Hotel Suicide photo while paging through a volume in the Life Library’s “Frontiers Of Photography” encyclopaedia (© 1971, 1972). Under the title “Street Scene,” the poem appears in my WordPress blog “Life Thoughts,” alongside and in amplification of an article on the topic of suicide, which I titled “The Unkindest Cut.” It wasn’t until yesterday morning that I came upon your article and was able to glean some facts surrounding the tragic event and the remarkable provenance of the photograph.